Google brings most of its apps to the Apple ecosystem and today, we have a new addition in the form of News and Weather. 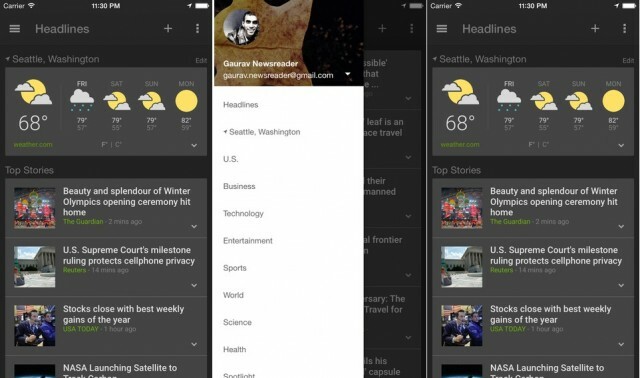 The Google News and Weather app is now available for iOS devices. As the name suggests, the Google News and Weather app brings you news from different sources along with weather information. To be more specific, Google News and Weather brings you news from more than 65,000 publications and there are various category of news such as Top Stories, Technology, Sports, Weather and more. You can also personalize the news on your interests such as “Fashion”, “Movies” etc.. The app also brings country-specific news editions for 60 countries. The app also brings you weather forecasts and more. The Google News and Weather app is available on the App Store to download, so hit the store link below and get downloading. If you are an owner of the latest iPhone 6 or the 6 Plus, the app already supports the new screen resolutions.